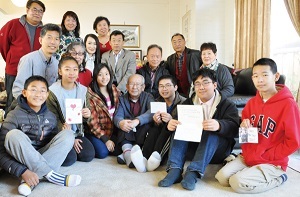 On the last day of 2016, Yuan Wen, president of Shin Shin Educational Foundation, led a group of volunteers and six students from the Youth Department to Shao Zhongquan’s home to deliver New Year’s greetings. Shao is one of the founders of the Foundation. Each child wrote a Chinese card in immaculate handwriting and took turns reading the card to Shao, “Thank you for setting up Shin Shin and giving us the opportunity to help others.” Gu Shufen, president of Northeast Association, and Liu Zhuo, president of Chamber of Commerce along with other members of their organizations also came with wishes for a prosperous New Year’s. Shao said that 20 years ago, there were few rural schools in China that even had buildings, and if there were buildings, they were often incomplete and in dis-repair, “It rains inside when it rains outside!”. Several founders wanted to help and give back to the rural school children, and help them to be educated in a comfortable and safe environment. “So we targeted the poorest areas to help them build schools.”. From its first school in the northeastern Heilongjiang Province to the present, Shin Shin has set up 340 schools in 25 provinces, and arranged teacher training to promote a better quality of educational for rural children. “At first the volunteers were all 70-year-old friends who wanted to give back to their hometown, and there were few young people involved. But with nearly 20 years of hard work, not only have many children in rural China received assistance, we have also organized youth group to get younger volunteers involved. It’s very commendable for our youth to be able to read and write Chinese. I hope they will continue to deliver Shin Shin’s spirit and purpose. Even though I am 88 years old it makes me feel younger when I see these young people united in a common purpose of helping the less fortunate. I hope to live to 100 years old and see the peace of the world, reflecting “a world for all the peoples.”. She also mentioned that students who live at the school also face a lot of inconvenience. “They have few extra-curricular books, and sometimes even no water for bath. I feel very distressed for them.” Despite all the lack of supplies, students still carefully make gifts and write cards to thank her, which deeply moved her.